Katya Delaney’s Desserts series is your semi-frequent installment of all things internet (and a few things internet-adjacent). Many of us are at an age where we remember the Dollz mania of the late ’90s and early ’00s. Round-faced and pixelated, they wore von Dutch hats and shirts that read “I hate prepz.” They staked their place on personal homepages, on MySpace banners, and in AIM profiles, amongst misremembered Dashboard Confessional and blink-182 lyrics. They were emblematic of a specific moment on the web, and for a while, we saw them everywhere… until one day we didn’t. The typical Dollz aesthetic was a distinctly 90s version of the eternal cry: “I’m a nonconforming teen.” And that wasn’t an accident. Dollz were the brainchild of a teen girl named Melicia Greenwood, or as she was known back then, shatteredinnocents; creating Dollz was her act of rebellion against the older users on a chat program called The Palace. The Palace was created by a guy named Jim Bumgardner (imagine growing up with that name) as a sort of Second Life before there was a Second Life. Founded in the mid-80s, it was a place where folks could chat with one another semi-anonymously behind 2D avatars. The Palace had a ton of different servers, but the most famous one — the one Dollz were born on — was called The Mansion. Needless to say, folks got bored with these smileys. But Jim didn’t want to allow custom avatars on The Palace. He reasoned that if he allowed users to upload their own images, he’d be opening the floodgates for lowbrow pop culture references and poorly rendered fan art. And when that happened, it would devalue The Palace’s cultural cachet. But people longed for the opportunity to make avatars representative of their identity, and Jim finally relented. Denizens of The Palace rejoiced. And this being the early 90s, what kind of images did they choose? Think low-resolution jpegs of Jerry Seinfeld. Then, nearly 10 years after The Palace was founded, Melicia Greenwood arrived. In 1995, the Palace had two key demographics: people who had been on the chat since the mid-80s — in other words, self-important, nerdy adults — and pre-teens and teens who were looking to talk to other people like them. Tension between these groups abounded. The younger users on The Palace took to Dollz like fish to water; soon it was easy to identify the Gen X and Millennial cohort by their Dollz avatars. That seriously annoyed the 30-somethings who were still using Jim Carrey in The Mask as their avatars; the Baby Boomers weren’t cool with their turf being overrun by teen/tween self-expression. The more the Baby Boomers complained, the more aggressively Gen Xers and Millennials championed Dollz. Eventually, the adults started calling Jim Bumgardner at all hours to complain about the younger users. Can you imagine being able call up Mark Zuckerberg’s personal line because you were sick of your nephew filling your newsfeed with memes? The early internet was a different place. The generational conflict was never fully resolved, but it’s a neat piece of internet archeology: an early sign of web tribalism. By 2003, “dolling” had exploded. 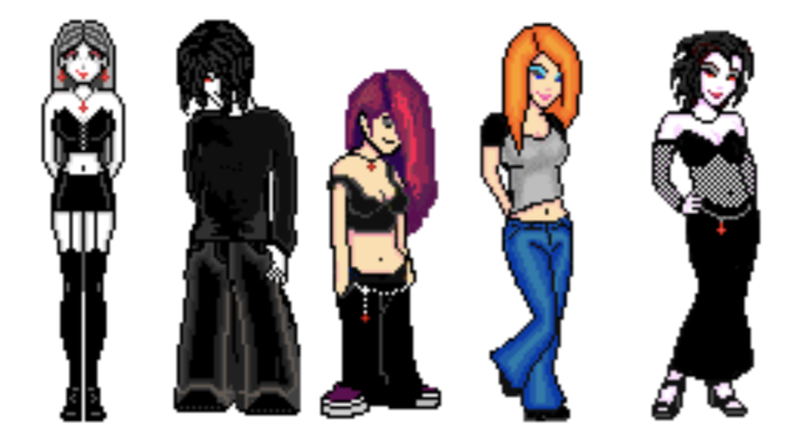 They were on t-shirts and mugs you could buy at mainstream stores like Spencer’s Gifts, Hot Topic, or much later, The Limited Too — and there were dozens of websites where you could make your own, like dressupgames.com and Dollz Mania. For over a decade, creating your own “doll” was a staple of the internet. Like Flash games and forum membership, it was hard to imagine the web without them. Even normies began putting Dollz on their MySpace and Geocities and AngelFire homepages. Dollz lived in instant-messenger profiles, in email signatures, and on forums. There were communities on LiveJournal, DeadJournal, Xanga, and DeviantArt where you could commission super-custom Dollz. And then one day… they were gone. Where does anything on the internet go? Like any trend, they faded away. As the web became less anonymous, maybe people didn’t need them anymore. Why would you want Dollz when you have MySpace angles? Now that there’s such a thing as “retro internet,” we’ve seen Dollz reemerge — not like it used to be, but they’ve never been completely forgotten. Today, Reddit communities commemorate Dollz, artists like Molly Soda use them in their work, ironic meme pages will throw a doll or two in a post, and nightlife personalities embellish promo posters with Dollz. A lot of us miss the early internet. Things may not have been safer back then, but they were definitely more fun. Maybe we can’t let go because, while there’s been a lot of change, there hasn’t been enough progress. As Dollz became increasingly popular, unique styles and genres emerged. Here are the ones I can remember. Unfortunately, they have not been well documented. *Thug/thugz/gangsta dollz were originally created, popularized, and primarily used by women of color. We do communications like it's our job.